Menorca shopping explains the shopping opportunites available and how to find those truly unique souvenirs of your visit to Menorca at great prices! If you are hoping for information about fridge magnets, postcards, keyrings an the rest of the mass produced items from Asia that are 99% the same in every tourist souvenir shop then this guide to shopping in Menorca is not for you! As an island that is basiclly flat and receives a large amount of rainfall every year cattle farming has been part of the islands heritage since pre Roman times. Naturally it follows that the leather by product of this activity has made its way into the principal commercial activities. In fact one of Spains famous shoe manufacturers, Jaime Mascaro, maintains the family factory (and outlet center) producing high class footware on the island. The traditional Menorcan Avaraca is however a completly different story! 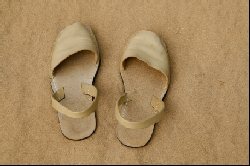 The Avaraca is the traditional Menorcan shoe that is famous for its ease of wear and comfort during the summer months. Almost unisex in design this simple style of slip on shoe can be had for as little as 15€ a pair and with a base made from the rubber of car tyres (in the most traditional versions) is ideal for the beach. Whilst supposedly "fashionable" versions exist these are almost identical to the 15€ pairs with the only difference being a "brand" that outside of Spain are unheard of by all but the most dedicated footware afficionado. Another by product of the cattle industry mentioned above, and a staple part of any Menorca shopping trip, the island has been dedicated to making cheese since the times when Greeks and Phonecians used Menorca as a trading point on their voyages around the mediteranean. Todays Menorcan cheesemakers use both a combination of traditional stone presses and modern technology depending on the producer although both methods produce a soft cheese not unlike British cheddar or Dutch Edam. Pricing of Menorcan cheese is somewhat difficult as the islands producers sell both to supermarkets and tourist stores / mini markets, each of which applies a greatly differing "mark up". For an approximation one can assume that a half Kilo / 1 pound cheese will cost around 8€ in a supermarket and anything up to 15€ in the more touristy stores. If you're worried about liking the "taste" you'll probably find that its the same or at least very similar to those on offer as part of your hotel breakfast! If your Spanish is up to the task you can always ask to "try before you buy" as this is commonplace. A hard dry cured sausage that has much in common with the Salchichon encountered on the peninsula these suasages have a slightly salted taste and go by the name of Carn-i-xulla. Normally consumed as either a mid afternoon snack or as part of a Tapa upon bread combined with cheese or tomatoe they make a great companion to full bodied red wines. As Menorcan sausage is sold "as produced" its almost impossible to try before you buy, although in complete honesty the flavours vary little so in reality theres little need to. As each sausage weighs a slightly different amount you have to check the ticket on the string for the actual price instead of the generic per kilo. Just remember that the string attaching the two ends is the only part you should handle unless you've purchased already! The versions that come pre packaged and not in natural skin are best avoided!